For an event three years in the making, it was not the massive crowds or transportation headaches that perhaps made the most indelible impression, but the simplicity and silence. 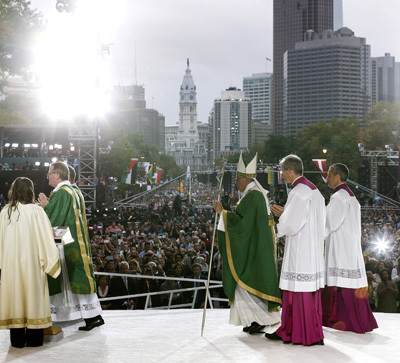 It wasn’t the first time the leader of the universal Catholic Church had visited Philadelphia, but it was the first time for Pope Francis, the first time a papal Mass had been celebrated down the length of the city’s brightest boulevard — the museum-studded Benjamin Franklin Parkway — and the first time for the many young people in attendance. 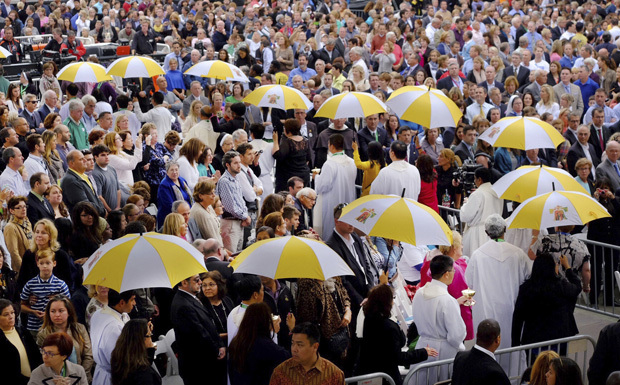 Pope Francis celebrated an afternoon Mass Sunday, Sept. 27 with cardinals, bishops, priests and about 6,000 exceedingly fortunate religious and lay people grouped around an expansive stage transformed into an elegant and spare sanctuary. Extending out behind the seating area were hundreds of thousands of people — estimates ranged from 300,000 to 800,000 — in the parkway and on side streets, stretching from 23rd Street all the way back nearly to City Hall. It was a two-mile long, open-air cathedral. 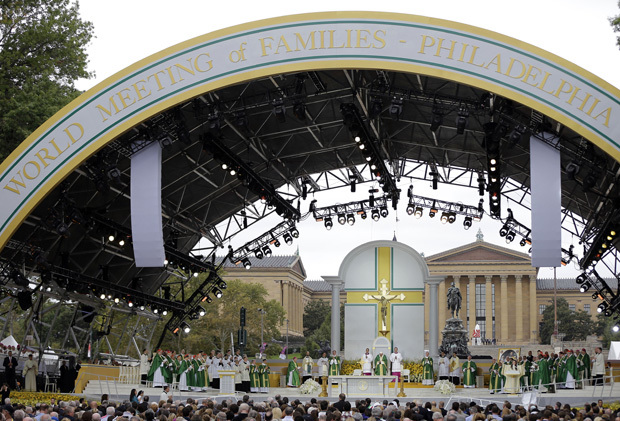 Yet despite the noise and commotion of so many people moving through the area, despite the frustration of hours-long delays at security checkpoints and closed streets throughout the center city area, an extraordinary serenity settled on the crowd as the 4 p.m. Mass began. Francis seemed to reflect the sacred atmosphere of praise and prayer, his face not weary as on Saturday when he arrived in the city or beaming at times during the lively Festival of Families the night before, but solemn. When he turned silent, as after distribution of holy Communion by 1,500 priests and deacons or after his homily, the congregation joined him in long periods of silent reflection. The sublime absence of sound, and the sight of Catholic Christians praying reverently after hearing the Word of God in the Scriptures and receiving the Eucharist, was for many in attendance a profound experience. Not that there was a shortage of remarkable moments in the two-hour liturgy. 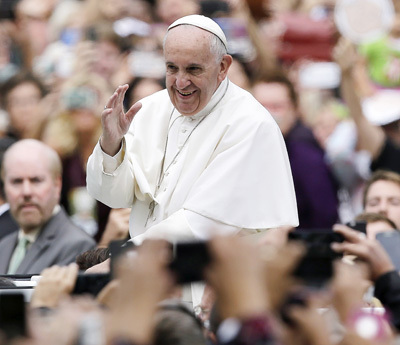 Even before, at around 3:15 p.m. Pope Francis rode in his popemobile along the parkway past cheering crowds. He took a much slower pace than the longer parade route of Saturday night. Aids walked alongside the pope’s converted Jeep Wrangler, passing several babies and little children for him to kiss tenderly. Because of the papal motorcade’s course, many side streets remained jammed with thousands of people trying to access security checkpoints but unable to proceed. Since most attendees arrived by bus and train from South Philadelphia and 30th Street Station, they had to go through magnetometers at the checkpoints on the south side of the parkway, overwhelming those stations. Some of the thousands of remarkably patient people reported waiting up to four hours to move four or five blocks up to the security areas. Some decided to give up as Mass time approached. Others began to stream in at least by the hundreds just before 4 p.m. as Philadelphia Police officers removed pedestrian barriers at the cross streets, relieving the pressure and allowing access to the parkway. Most of the faithful present watched the Mass from large-screen Jumbotrons which included text captions for every word spoken and sung throughout the liturgy. Some inaccurate transcriptions provided a chuckle or two from the worshipers. But worship they did, led by men and women cantors, a 500-voice choir made up of mostly of some of the finest members of parish choirs in the Philadelphia Archdiocese. Choir director David Kimmock led the singers, accompanied by organist Sandor Kadar and the Philadelphia Orchestra, conducted by music director Yannick Nezet-Seguin. After readings for the 26th Sunday in Ordinary Time in Spanish, Vietnamese and English – the Gospel was sung by Deacon Matthew Biedrzycki – Pope Francis preached his homily in Spanish, with translation into English on the big screens. He called for the Christian faithful to trust that God continues to work powerfully in individuals’ lives. His desire for unity, not division among all people, was a reflection of one of the themes from Francis’ visit to Philadelphia for two days this week, and for four days preceding in New York and Washington. No one must exclude others from experiencing God’s love, truth and beauty in their lives, and the teachings of Jesus in the Gospel must be shared by everyone in the church with everyone in the world, without exception, he suggested. The pope praised and encouraged loving families — another consistent theme, since he came to Philadelphia to close the World Meeting of Families –and the “little gestures” of family life that show love most profoundly. Many family members present shared silent, knowing looks when hearing the pope’s words. The imperative to reach out beyond oneself to spread the Christian faith, and to challenge oneself anew to do so, also was a consistent message of Pope Francis. On his first apostolic trip to the United States, he similarly challenged lay Catholics and their leaders alike to make a personal commitment for evangelization to all, and outreach to the poor and marginalized. “Would that all of us could be open to miracles of love for the sake of all the families of the world, and thus overcome the scandal of a narrow, petty love, closed in on itself, impatient of others!” he said. 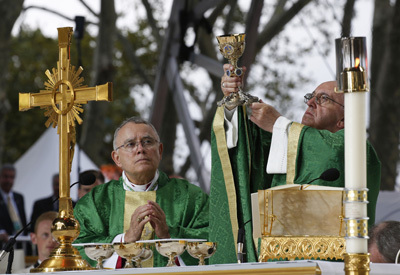 After the liturgy of the Eucharist, Archbishop Charles Chaput thanked the pope for his presence. Archbishop Vincenzo Paglia followed, announcing that the next World Meeting would be held in 2018 in Dublin, Ireland. Archbishop Diarmid Martin of Dublin exchanged an embrace with the pope and with Archbishop Chaput. Pope Francis closed the Mass, after the blessing, with a similar message as at other visits: “Please pray for me,” he asked the crowd. “Don’t forget, pray for me.” Judging by the sustained applause of the faithful, he can rest assured of such prayers. Can you tell me who the organist, First name Michael is or was at the Cathedral? I have forgotten his last name. Please tell us who the woman was who sang the liturgy at Sunday”s Parkway Mass and at St Charles on Saturday. The female cantor for Saturday’s mass at the Cathedral and Sunday’s mass on the Parkway was Charlene Angelini.